Equipment: One sheet of paper and a pen/pencil per player; one die per group (note: the plural of die is dice). 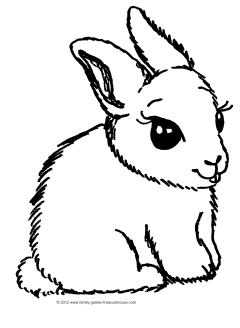 Aim: To be the first to draw a bunny in your group. 1. Each player in the group throws the die once to see if they can add a body part to their drawing of a bunny. 2. Every player will need to throw a "1" before they can draw the body and feet. On subsequent turns, they throw the die again to see if they can add further body parts. 3. Players must throw a "2" (head) before they can add the two eyes (by throwing two "4s"), the mouth and nose (a "3") and then the two ears (two "5s"). They can add the tail (a "6") at any time once they have a body. 4. Except for the body, it is not necessary to draw the other body parts in any particular order. For example, you may draw one eye, then the tail, then the mouth/nose, both ears and the final eye, depending on the throw of the die. 5. If a player has drawn one (or both) body part and then throw that number again, they miss that turn and cannot draw anything. For example, if they have drawn both ears and then throw another "5", they forfeit that turn. 6. The first player to complete their drawing shouts "Bunny" and wins a prize. NOTE: As well as the winner of Draw the Bunny, extra prizes could be awarded for the most artistic bunny. A free printable version of the diagrams above (the Bunny and the Parts Table - two copies per page) is available here. 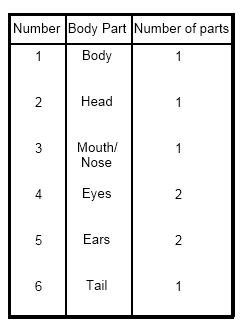 Simply print it out and give a copy to each group.